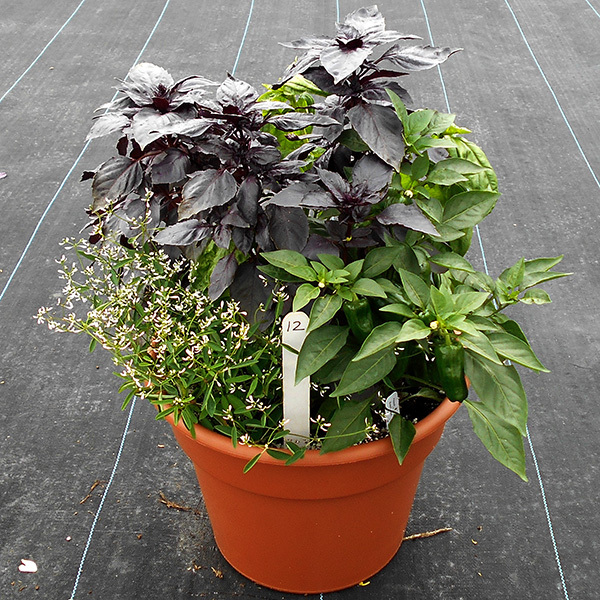 Read GrowerTalks article - Article starts on page 90. 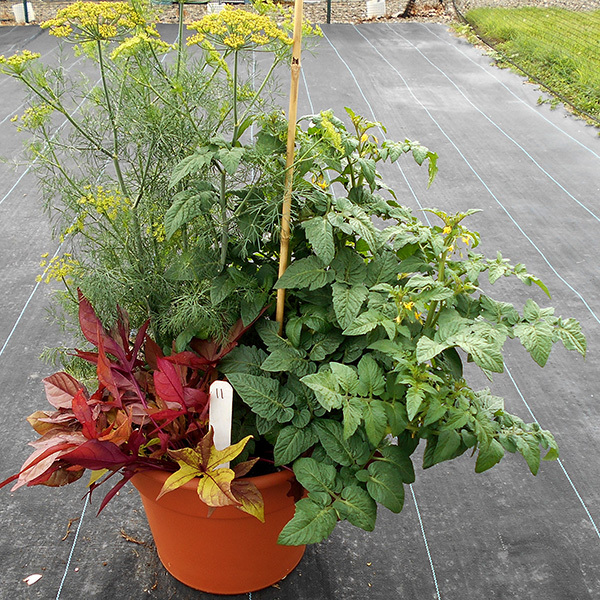 With interest in small-scale, multi-functional gardens continuing to grow, we decided to experiment with mixed vegetable, herb, and ornamental containers. 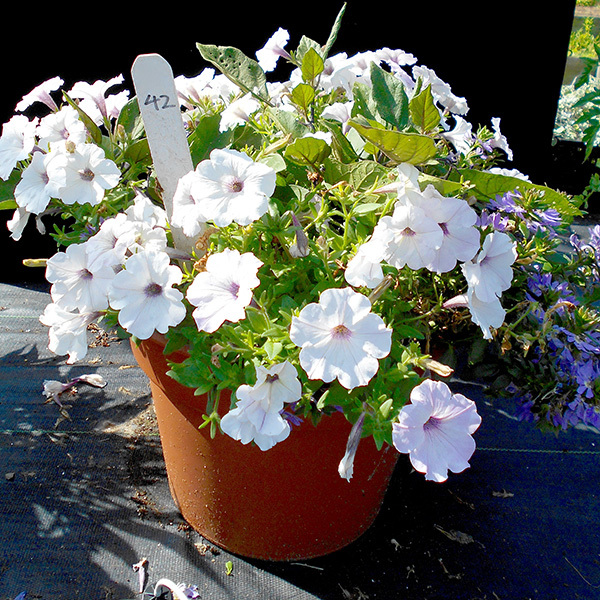 Partnering with Cheni Filios, Production Line Manager at PanAmerican Seed Company, we put together several dozen large (14”) containers and presented them at Cornell University’s annual Floriculture Field Day on August 11. 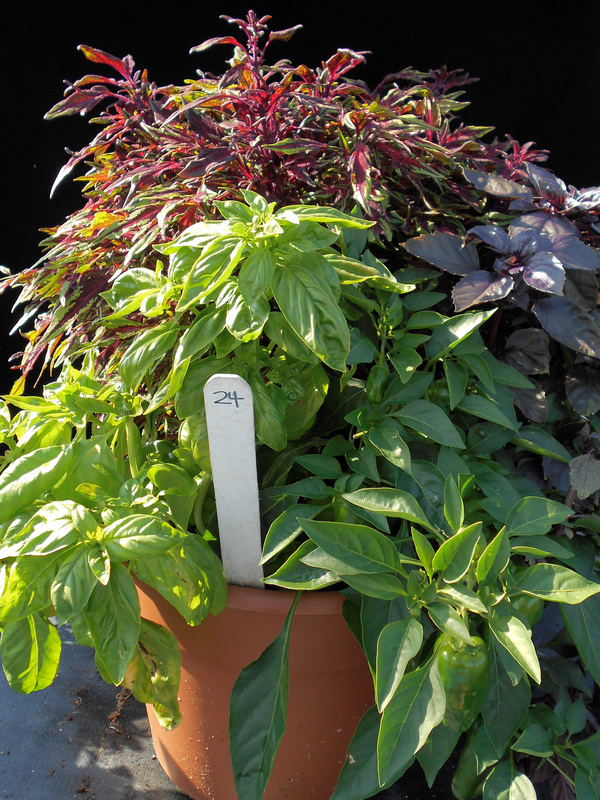 PanAmerican Seed Company donated most of the vegetable and herb varieties. 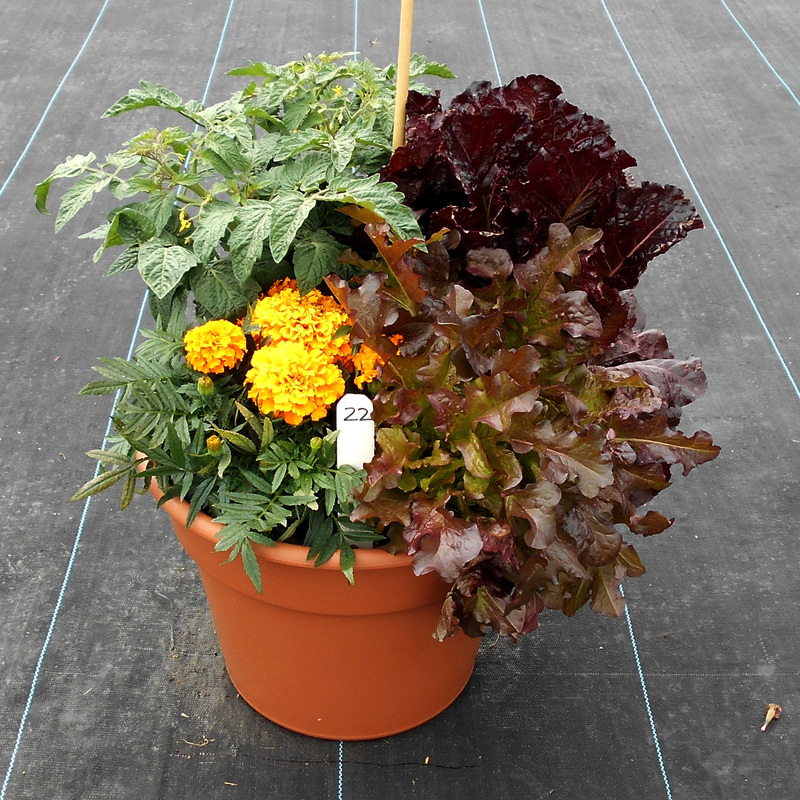 Ornamentals were selected from among the varieties submitted for our annual trials or from donations by Baker’s Acres and Dickman Farms in upstate NY. What happens when elements are out of balance. This container is an example of what can happen when one element has a more aggressive growth habit than the others. Te petunia in this pot completely overpowers the pepper and basil. 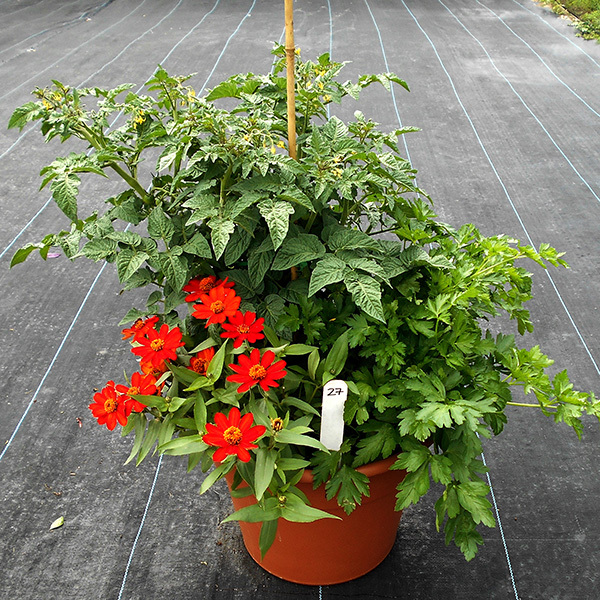 The tomato in this container cannot compete with the Lobelia and Scaevola. We tried to keep our protocol as simple as possible. Vegetables and herbs were sown in 200- and 72-cell plug trays, respectively, on 3/25/15. 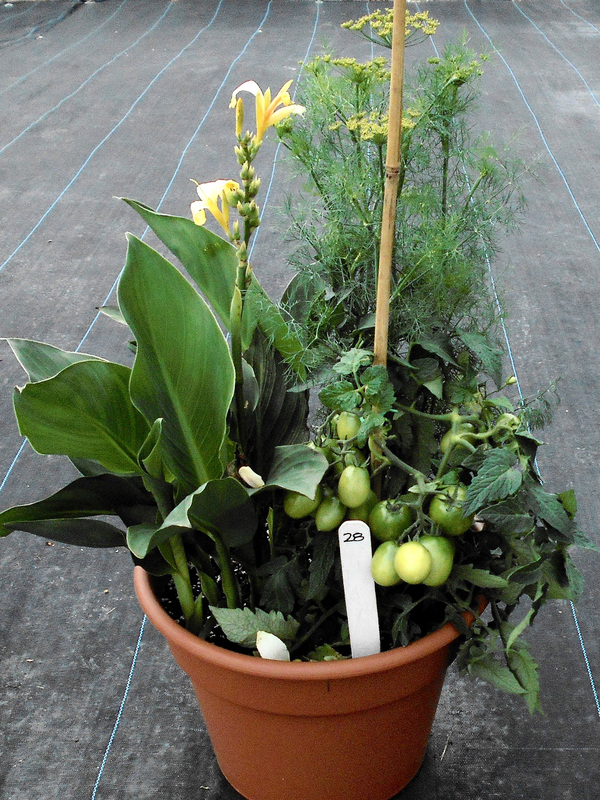 They were transplanted to 4” containers on 4/22/15, and then into the final 14” containers on 5/20/15. Lettuce mixes were sown in 72 plug trays on 4/22/15, then directly transplanted into 14” containers on 5/20/15 along with the vegetables and herbs. 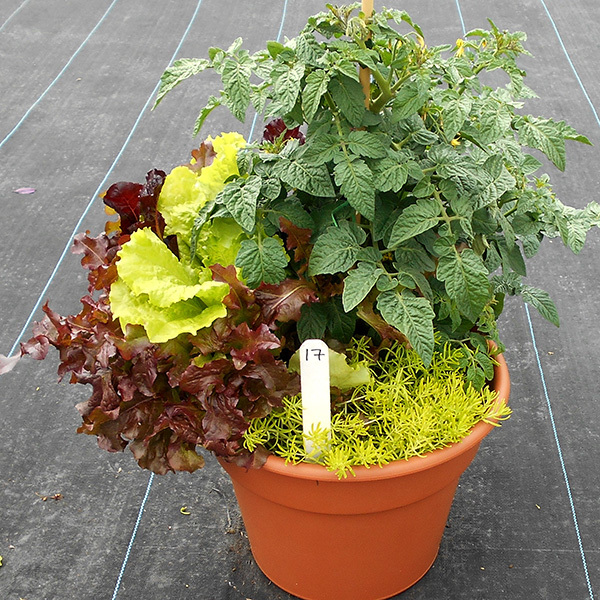 A professional peat/perlite potting mix (Lambert LM-111) was used in all 4- and 14-inch containers. All plants were grown in the greenhouse until they were transplanted into the 14” containers, at which time they were moved outside. 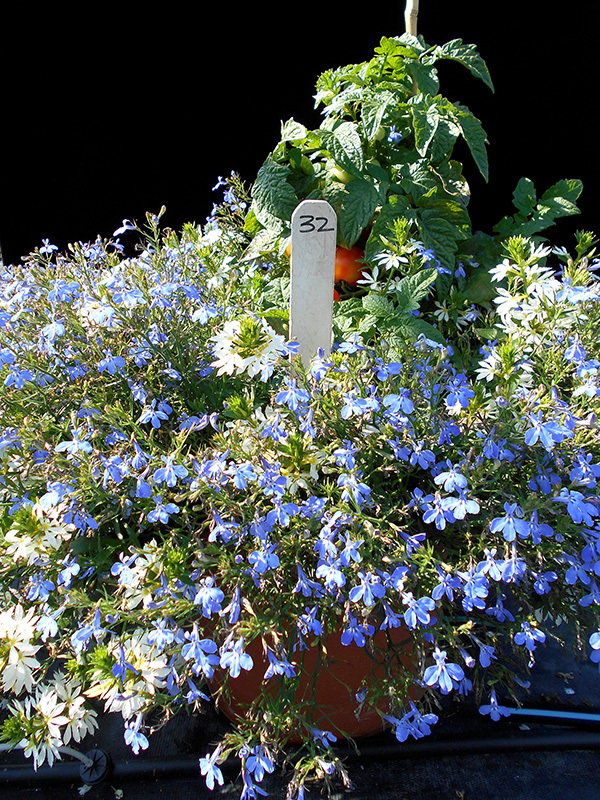 In the greenhouse, seedlings received a standard fertilizer regime of Jack’s 21-5-20 at 100 ppm N plus Epsom salts (magnesium sulfate) at 30 ppm Mg twice weekly. Since we wanted our final product to be edible, pests were controlled with biocontrols only. Once moved outside, they received Jack’s 15-5-15 Cal/Mag once per week at a rate of 750 ppm N throughout the summer. This rate was chosen to mimic what a consumer would provide if using about one tablespoon of fertilizer per gallon of water once per week. 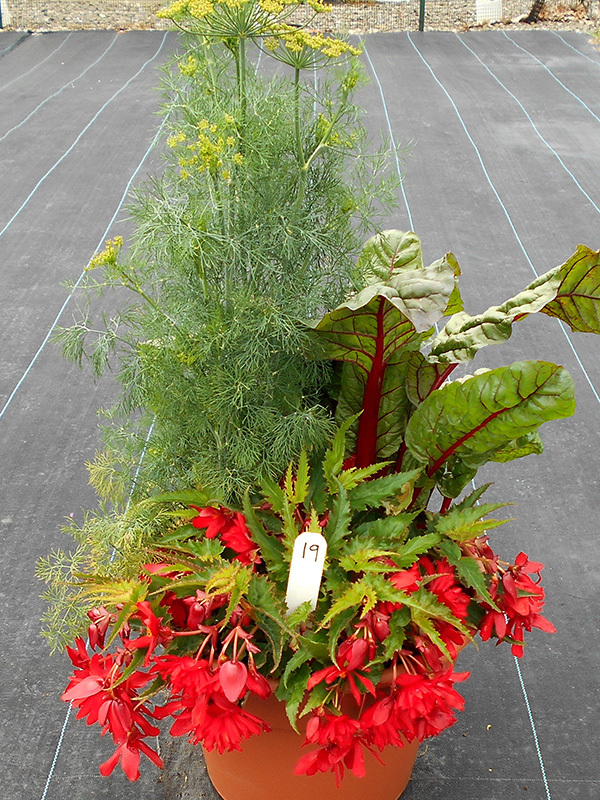 The results were even better than we had hoped; many of these combination planters were simply stunning. 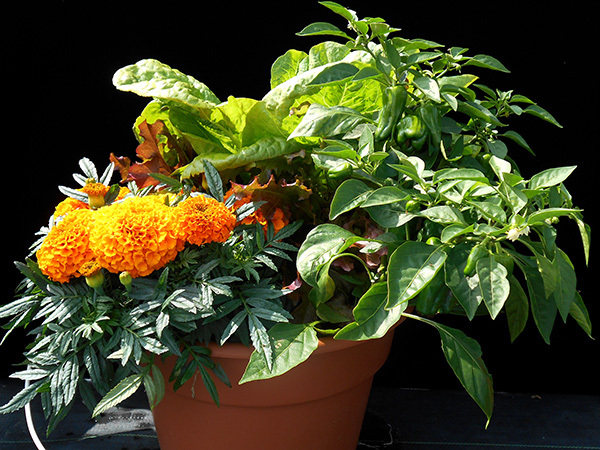 The containers were not only beautiful, with bright splashes of color and texture, but also produced bumper crops of fresh vegetables: tomato, pepper, and eggplant harvests were abundant. Feedback from our growers at the field day was positive, too; the containers generated a buzz, with many favorable comments regarding their novelty and functionality. One thing we learned from this trial is that not every combination works perfectly. Some combinations were unsuccessful, with one component overpowering the others as the trio matured. 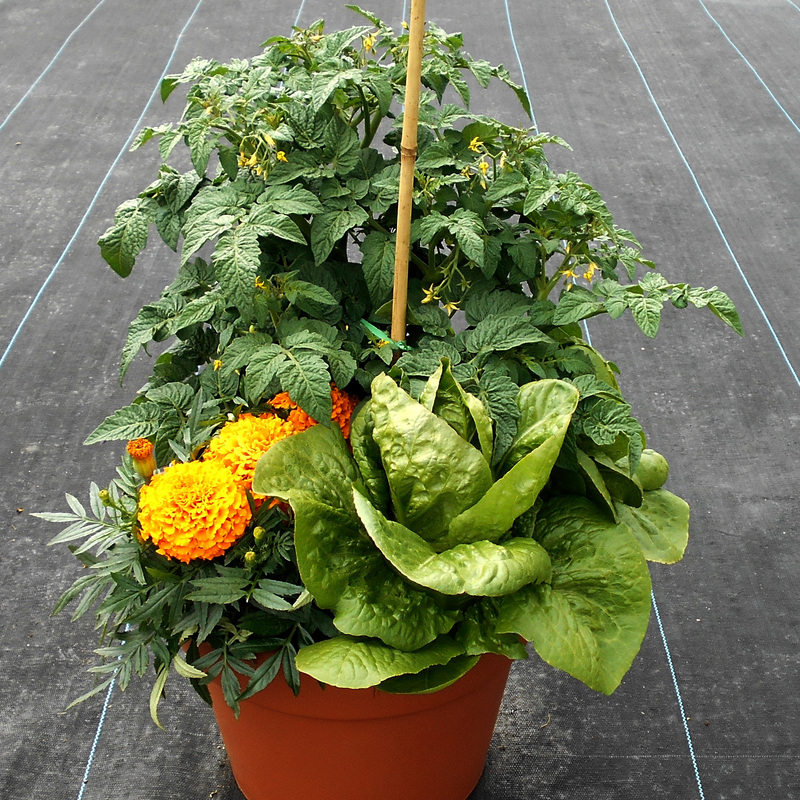 For vegetables, dwarf determinate tomatoes and patio varieties of other vegetables seem to be the best bet. Some vegetables have a shorter container life than others. These plants can be removed after harvesting to let the other varieties continue to show off. 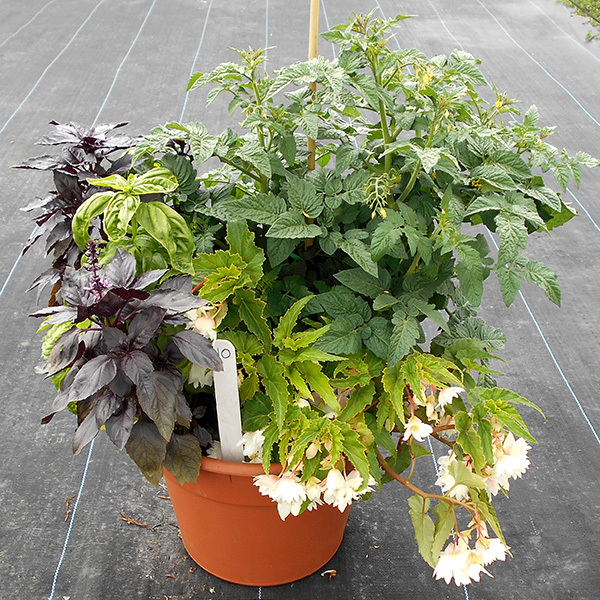 Having seen the results of this trial - the good, the bad, and the just plain ugly - we look forward to further experiments with vegetable, herb, and ornamental combinations in the coming year. Stay tuned for future tips for successful mixed vegetable and ornamental (MVO) container gardening! 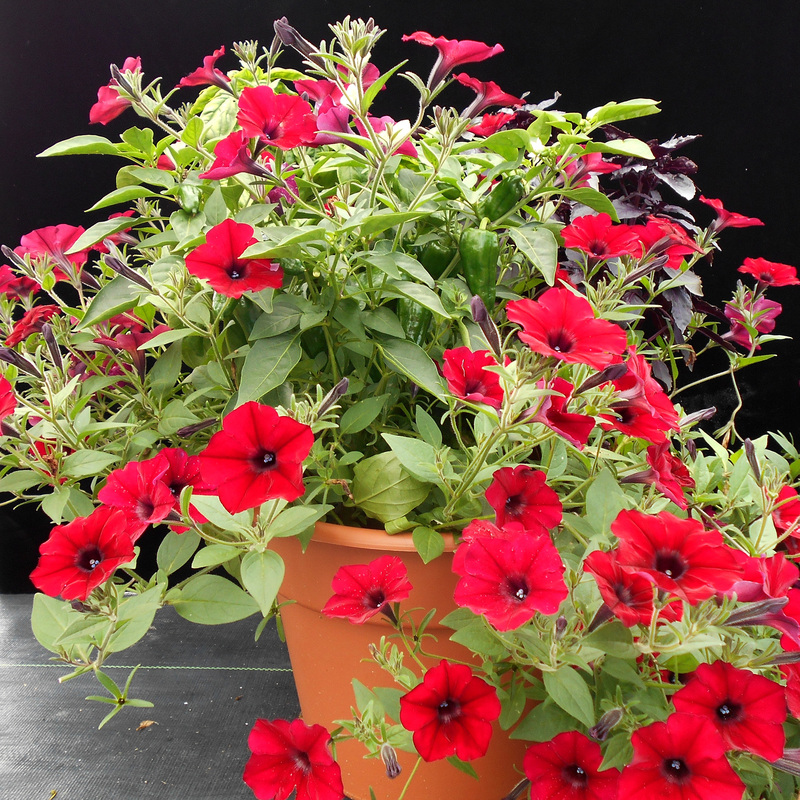 Kendra Hutchins, koh4@cornell.edu, is Program Coordinator of the Cornell Annual Flower Trials. Bill Miller is Professor and Neil Mattson is Associate Professor at Cornell University. Cheni Filios is Production Line Manager at PanAmerican Seed Company.